Plan, manage, and optimize global industrial operations via a detailed virtual simulation. DELMIA is a Manufacturing Lifecycle Management (MLM) solution that brings all your worldwide intellectual property and processes into a virtual simulation to plan, monitor, and optimize manufacturing processes and shop floor operations including capacity planning, implementation, monitoring and sign off. Plan, simulate, and model global production processes and experience your entire factory production in a virtual environment. Includes modules covering ergonomics, machining, process planning, and robotics. Create and optimize build-to-order and lean production manufacturing systems. Address and shift processes to quickly respond to competition or new market opportunities. Track real-time production activities, perform schedule changes, launch new programs, introduce model changeovers, and schedule maintenance operations. Virtually define and optimize manufacturing assets concurrently with manufacturing planning. Manage manufacturing operations from an enterprise-wide perspective by improving visibility into and control over manufacturing operations and supply chain processes on a truly global scale. 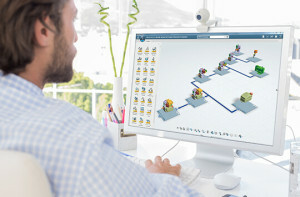 Orchestrate people, plant and equipment processes to improve collaboration and synchronization. Achieve real-time visibility, control, and synchronization of business processes spanning global operations. Establish a common set of operational processes that can be created, managed and governed on a global scale. Extract real-time manufacturing intelligence to support global continuous process improvement. Improve efficiency, remove waste, and reduce costs while increasing quality with the holistic control of your global manufacturing processes that Delmia provides. Plan workforce, manufacturing environment, and logistics operations for complex business processes. Plan across all planning horizons for optimal results. Solve the toughest operations planning and optimization puzzles. Gain immediate insight to minimize consequences and disruptions. Receive instant KPI feedback on the quality of decisions. Contact us to today to purchase, for DELMIA Price Information, a DELMIA Trial, or to learn more about how DELMIA V6 can enhance your planning processes.